CallTech, trading as AAAHeadsets, accept payment via Visa, MasterCard or provides 30 day accounts. This is TOTAL price. YOU DO NOT HAVE TO ADD FREIGHT. Multi-Device Two Ear Wireless Headset System. Singular Control. Ideal for Hot Desking in a job sharing environment. The Savi® W720 is changing the way productivity-focused office professionals communicate. With three-way connectivity, easily manage and switch between PC, desk phone, and now mobile2 calls from a single wireless headset. The Savi 700 series is the only headset family available that works with office + computer + mobile phones. This headset complies with the Australian ACIF G616:2013 Guidelines. Optimized for Unified Communications, the system automatically updates your status* to “busy” on PC, mobile and even desk phone calls so colleagues can see your availability. This intelligent system combines best-in-class sound quality, hands-free mobility and hours of talk time for ultimate efficiency. Once you experience a Savi W720 headset system you’ll wonder how you ever lived without it. Charging base unplugs - allowing multiple shift workers who share one telephone or radio, to each have their own headset. 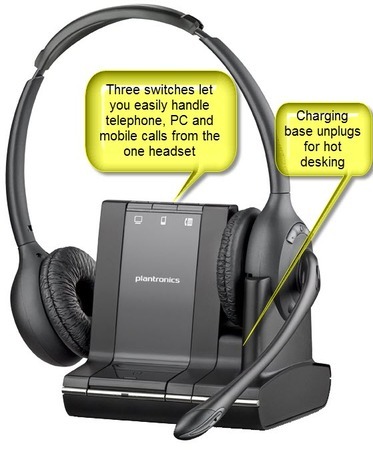 Plantronics advise that 70 headsets can simultaneously operate in the one office. This can be any combination of CS or Savi headsets. 1. This headset shares a common base station with all the Savi series headsets (i.e. W710, W720, W730 & W740). If you look under this base you should find "plantronics W02A". A further attachment plugs into this base. This attachment varies depending upon the Savi headset model that it was made for. 2. The default settings within these headsets have the mobile phone connectivity functionality disabled. Instructions on how to enable this functionality can be found in the paper "Activating The Mobile Pairing Feature On Your Plantronics Savi Wireless Headset". Queensland (QLD), South Australia (SA), Tasmania (TAS), Western Australia (WA), Northern Territory (NT). Major areas covered include: Adelaide, Albany, Brisbane, Bunbury, Canberra, Darwin, Esperance, Fremantle, Geraldton, Hobart, Joondalup, Kalgoorlie, Mandurah, Melbourne, Perth, Port Hedland, Rockingham, Sydney.